Without thread, embroidery is just a piece of fabric. . . The thread can make a great design more beautiful or take an excellent design and make it average. When newbies first buy their machines, they usually have no idea what purchases await them. I know that I didn't! You may have read my blog on "Needles" which touched on thread as well. After all they are like bacon and eggs - beans and franks - chips and salsa - before I get any more hungry, let's continue! Thread racks are loaded so many scrumptious threads to choose from that making a choice is a project in its own. Even if you have 5 delightful pinks at home, there is always one talking to you from the rack. Subtle color changes in threads can make an embroidery project all the more remarkable and breathtaking. The viewer may or may not see the subtle changes of 7 different pinks, but they will see the depth and breadth of color. Thread, like fabric, is made from either synthetic or natural fibers, or both, and each has its own purpose. I am going to discuss a few of the types and then get into my purpose of this posting which is saving money on threads. 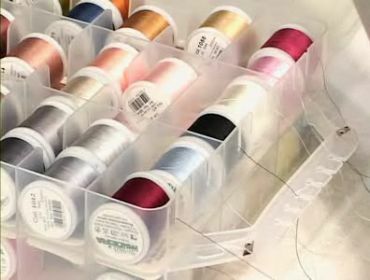 This thread is the embroiderer's thread of choice because of its high sheen, availability and trouble-free performance. Rayon holds up to high-speed stitching with less breaking or fraying. Rayon's color range of solid, variegated colors and twists are amazing. That twist is created from 2 or more colors twisted together to create a single strand and adds shading and dimension to your work. Available in a standard 40 wt. and a thicker 30 wt rayon leads the pack. 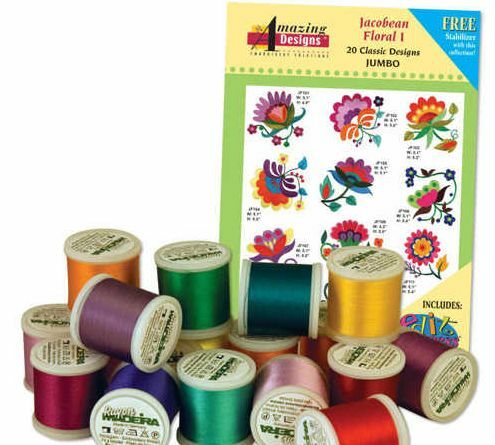 More economical for embroidery, polyester thread is comparable to rayon. It doesn't shrink or fade and is a good choice for children's and other items that demands strength and durability. It is considered to be less shiny than Rayon, but frankly, most individuals would be hard pressed to see any difference. With changes and enhancements in embroidery every day, that issue is really almost a mute point. What can I say about silk? It is a wonderful thread that is always a show stopper. It does absorb dyes more brilliantly than all other fibers. It is strong and stable and sews without breaking. The cost will keep the most timid of us away, but for something really special, you might just consider it; luxury is the bottom line on this one. 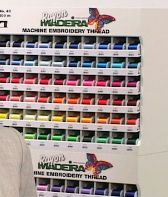 Cotton can be used in automatic embroidery machines. Probably its best attribute is that it comes in weights up to a very fine 100, which most consider heirloom quality. Cotton does wonderful things for details like small facial features or hands. That fine of a thread would have been used years and centuries before, but is weaker than the 30 to 50 weight threads currently in use. 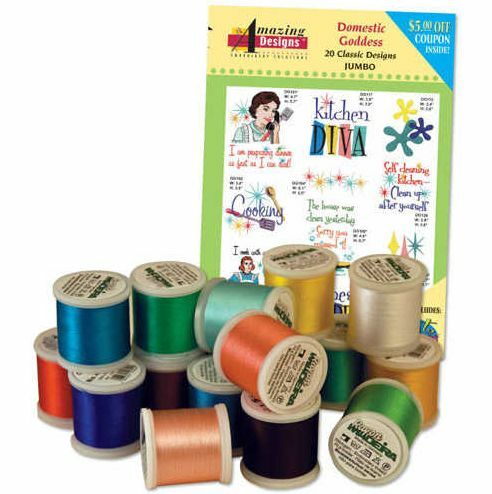 If you want to start a lively discussion among a group of embroiderers, bring up the subject of metallic thread! Considering the complexities of manufacturing metallic threads, it is one of the most daunting decisions an embroider needs to make. We love the results but cringe at the thought of using them because they require a little gentle treatment. 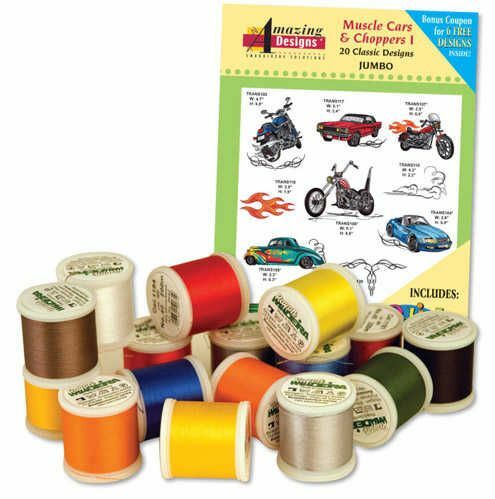 I feel like I treat my metallic thread better than my first born. . . Experimentation is the key. If a coffee can works for you, terrific, if you need to freeze it, that is your choice. I personally unwrap a portion of the spool and let it hang for about 10 minutes before using. I consistently recommend to anyone that they do a few things in relationship to their purchases of thread. After all, it is probably the second highest cost of your craft. Choose wisely and save money. Consider buying a ‘package' deal for your initial thread purchase. The reason is that they are put together by a colorist who has an education in hues, saturation and color values. If you want to put a purple with a coral, having the correct hue will make them great together and really "pop." Even among a single color, example - green - may not work with the other green variations you have. Have you ever put together an avocado and grass green? A good color education is worth its weight in gold! Check out these packages right here at AnnTheGran. They are color coordinated and very reasonably priced. For the groups. The demonstration for the "Incredible Threadable" box shows a price of $159 but Ann sells it for $99. That is $2.25 per spool, an excellent price. When you are looking for a design and let's say you are wanting a Jacobean design. What do you look at next? Commonly you will look at the size and then the colors. Colors catch your eye and hold your interest. Then your project starts to take shape in your mind. You can get this 'set' or you can spend a lot of time trying to mix and match the colors. After you have the set, you then have a grouping of coordinating colors in your stash. How about kitchen designs for brides and anniversaries? You do remember that when you have been married for a long time, some of your kitchen ware is a little shopworn??!! With this kitchen set (great colors for you to renew your kitchen with) comes with skin tones and fruit colors as well. Got to do something for a special man but stumped? How about those wonderful Muscle Cars from the 60s and 70s? Capturing those colors will bring back lots of great memories. A red may be nice, but I remember 'candy apple red' on my brother's 1957 Chevy. It was a knock out! Put something on a BBQ apron and watch the fun begin when stories start about those guys and their first cars! You have seen these displays. They are so inviting to look at. The colors are laid out to make them enticing and, again, coordinated. The colors do not just drop into formation, there is a plan. Look over your designs for ideas as to what you may need. Do you lean toward animal or floral designs? For wonderful animal designs, accuracy is the key but floral designs can be a lot of fun and a little off the mark. Do you prefer correctness of color or have a wilder side? After you see what you tend to like, the next step is to look at what the digitizer of the design calls for in the color palette. You may see similar colors start to show up in your designs selections. If you like landscapes, you are going to need more blues, greens, browns, golds and gray to black shades. What is your embroidery focus? Don't forget that you will be using a lot of the white family so get a nice selection of colors. You need about 5 to 7 white colors. I personally almost never use black. If I need something dark, I use something to complement the design such as egg plant or charcoal. So, buy white when it is on sale and for the fuchsia with undertones of green, get a smaller spool. That unusual color may become dried out (remember my silicon blog?) before you can use it up. It may be more costly per yard, but less pricy per use. Have fun with your thread. It creates the very life of embroidery. Thank you for the great info on thread. I'm new to embroidery and yes, this was one thing that confused me. Hello everyone! I am glad you are getting some good info here at AnnTheGran. On the metallic thread, I took a metalic that I felt was totally worthless (it may or may not have been) and started to unroll it. One thing I noticed was that the metalic had a very slight stick to the inner thread. I took a rayon thread and it had less 'stick' to the underlying thread. I thought that was a good clue. It is not that it stuck to the roll, it was more that it did not have the ability to easily unroll itself. I think that some who refrigerate their metalics may have the same result but I did not have success with chilling my thread. After removing about 5 yards of metalic, I placed it between two chairs to let it 'relax.' That is what I felt I was doing, relaxing the metalic. I loosely rerolled the thread to use and I had no breakage. I did have to watch for my end point because 5 yards may be too short for your project. Frankly, 5 yards goes a long way if you are doing a straight stitch. If you are doing a satin stitch, it will be used up much faster. If something else worked for you, let us know. Not every method works for everyone. Each manufacturer is different and thread can be old or less pliable, etc. I slow my machine way down when I use the metallics. I usually have very minimal breakage. I never thought to unwind it before using. I usually don't have the space. When I am in the sewing room, the dogs follow and pace. It may take longer when the machine is slower, but it is worth it. cme - you are so right. I had forgotten that one. Speed is trouble with metallics. I like the idea of hanging the metallic thread and slowing the macine down. Thanks for the tip. Now I would like to know where to get conversion charts for all the different threads.